Ryder & Dutton are delighted to be able to introduce an exciting new scheme for Landlords called 'Secure Rent 1-2-3' that launches on 1st August 2016. This exclusive new scheme means Landlords will no longer need to worry about rent arrears again. 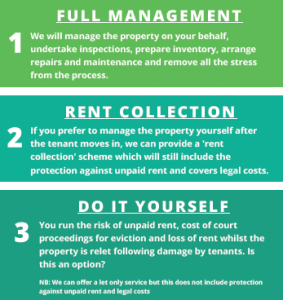 With our fully managed or rent collection services, if your tenant falls into arrears, Ryder & Dutton will pay the rent due and also pay it every month until the tenant pays the arrears or is evicted. The first month's rent will be paid to you 10 working days after it is due but subsequent months rent will be paid as normal. The legal costs of eviction are covered and after eviction we will also pay 75% of the rent for up to two months until another tenant is found. Contact your local office for further details - it might cost less than you think.